Our NDEW event was part of a larger Ramsey city carnival event. We had a dedicated EV street as part of the festivities. 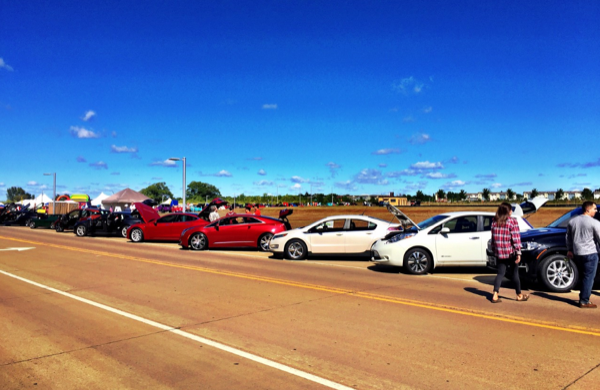 After a three-hour window of test drives and people viewing EVs and talking to owners, 5 of the vehicles that were on display participated in the parade along with classic cars and other parade participants. As part of Ramsey’s Happy Days car show event, we are pleased to have a dedicated street to feature electric vehicles. Included in this street will be a number of different makes and models of electric vehicles displayed by their owners. We are also very excited to have several auto dealers providing electric vehicles to test drive during the event. In addition to the Electric Vehicle Street, several unique electric vehicles such as a falcon wing Tesla and a bubble blowing LEAF will be featured in the Happy Days parade starting at 3:00 PM. Registered attendees report 204,151 electric miles driven.